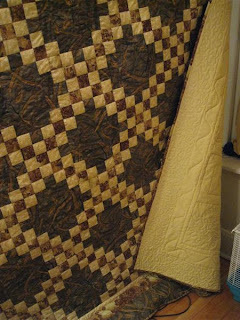 Crispy said such wonderful things about my quilting when she advertised my give-away (thanks for that!!! 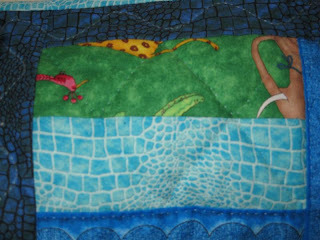 ), I feel all gooey inside :) It really means so much to get such compliments from fellow quilters. I love all the visitors coming to my blog and the comments that have been rolling in :) They all put a smile on my face! 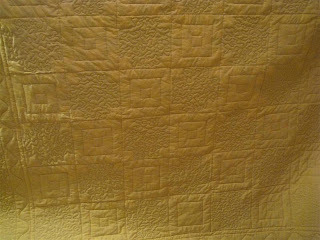 I've been quilting away on the cutlery quilt, the center is done - hooray! 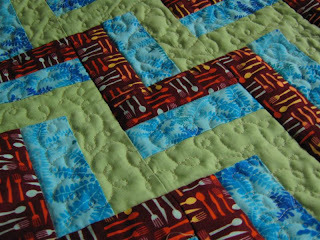 I thought long and hard about the type of quilting I wanted to do to flatten the strips in between the cutlery zigzag. In the end, the choice fell on the free-motion loopy-loops since I really like them. I want to try pebbles and grids soon, too. In the end, I'm really happy with the popping zigzags, I hope it shows in the picture, because my view is biased of course since I see the quilt 3-D. Okay, here we go - this is so exciting! My give-away has two parts. 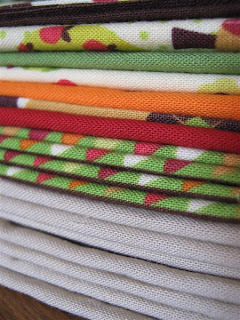 I picked fat quarters from an eclectic mix of fabrics to give away. The two winners will each win 3 fat quarters from this selection, and there is some bonus fabric for the winner who completes the challenge part. 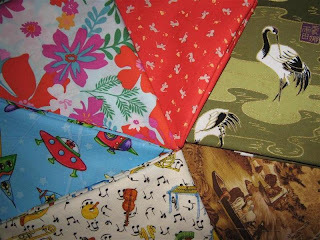 We've got cranes, tiny mice and cheese, musical instruments, rockets, Hawaiian flowers and brown toile looking for new homes! 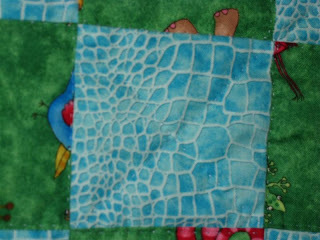 The winner of the challenge will win a piece of fabric I used in the Fun On Ice quilt, it's shown in this next picture. 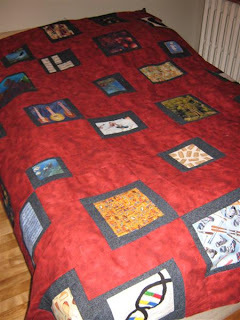 Here is the finished quilt (with a few loose threads still to be tucked away). Both give-aways are open till August 10 at noon (PEI time), that gives you almost 2 weeks! One comment per person please (with or without the answer to the challenge - just try your luck!) - and I'll pick a random winner. So tell all your friends and fellow bloggers about the give-away, and I look forward to shipping out some fat quarters! ... for a give-away next week! 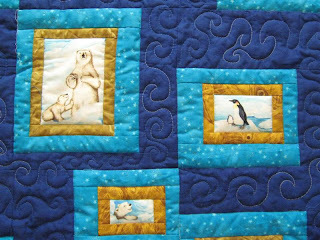 It'll be related to the polar bear quilt... I'm not revealing anything else right now. Holy moley! I basted and quilted the basic outlines on both baby quilts last night and sewed the top side of the binding on by this morning. I'm on a drive for these two quilts it seems! 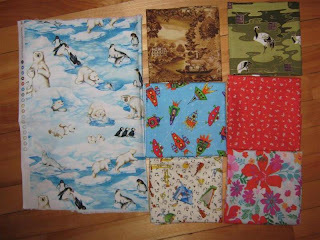 I'll get them bound this weekend and decide on what kind of extra quilting - if any - I want for each quilt. 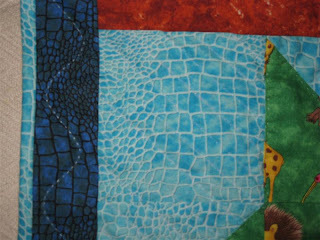 I've outlined the beige and starry blue border on the polar bear quilt and the panels really pop out since the batting on that quilt is fairly thick; on the cutlery quilt, I've outlined the red-brown cutlery zig-zag pattern going through the quilt and am considering an overall pattern to fill in the areas in between (pale green and blue) to make the zig-zag lines pop out. Maybe waves or loops... or maybe something more complicated for practice! 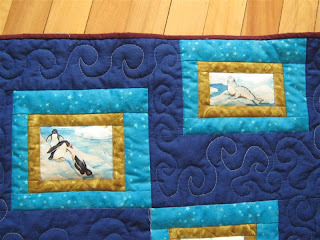 I've drawn great inspiration from Diane Gaudinsky's blog (see my blog bar) and her breath-taking machine free-motion quilting. I worked late last night because I really wanted to get these two baby quilt tops together. I added a bit of yellow through the borders as the pale green made it look a bit too blah before. 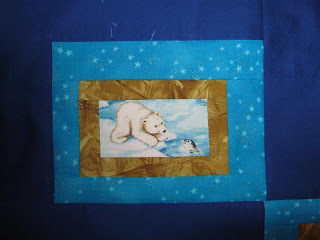 And I also cut the borders for the polar bear quilt top and put the blocks together - familiar layout now, isn't it? I have the backings for both of these quilts cut out - flanelette for both - and have enough batting in the house, so I might even get both of these basted tonight. Yay for progress! As promised, I have photos of the finished quilt top! Despite Crispy's worries about my organization based on the pile of blocks strewn over my living room floor, I was quite organized. It was well-organized chaos! I had pages of calculations of the strips I needed for the red borders on each block. I had planned on top and bottom borders of different widths, same as the black borders. 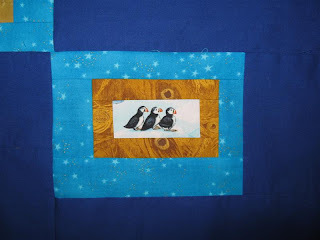 I added the borders together and cut just one strip for the side borders and one for the top and bottom so that I could decide based on my block layout which borders would be fat and which skinny. That plan changed when I laid out the top with the blocks and just two border strips (so the black-framed block was always in a corner). It gave a great random looking layout, and I left it that way - save time too :) I played around with a lot of layouts and finally settled on this one. 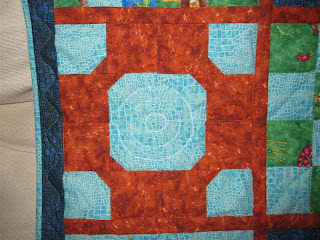 Note that two block are still empty, in the top right and bottom left corner - those were kept for applique - exciting! 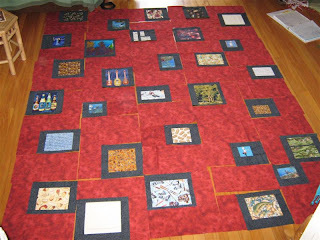 I love the black and red fabrics together - I think the combination strikes a good balance with the multi-coloured blocks, so that the quilt does look a bit more grown-up than if I had used all different coloured borders. 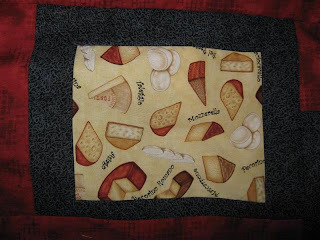 1) The cheese fabric I searched for so desperately and now has quite a story behind it. 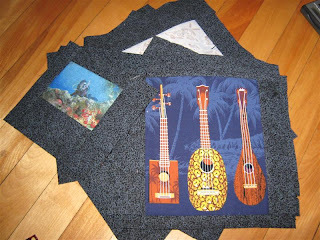 2) This classical music block used fabric scraps that I received from a quilter at the other end of the island. In the middle of my fabric search, I happened to visit a bargain store that sells quite a range of fabrics and happened to have a quilt show that day. 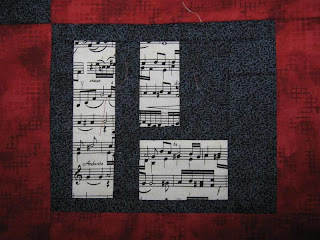 I spotted the sheet music fabric in a quilt and asked the maker where she got the fabric. She couldn't remember but said she had some scraps left. We arranged a transfer and while the scraps were fairly small (the long skinny piece is about 5" long, I think) I managed to stretch them into a block. 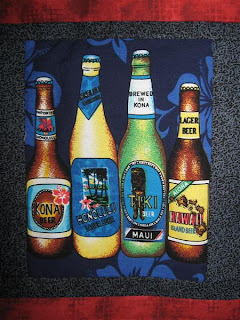 3) The beer block - this was dirt cheap fabric I noticed at the local fabric chain store. I thought about buying it, but didn't have any use and was just starting to not buy fabric just because it's cheap. 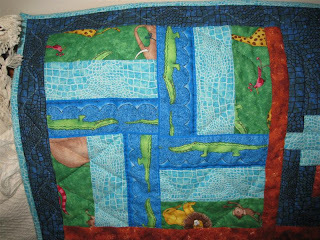 Two months later I thought of making the character quilt and of course the entire bolt was gone. The woman at the store said a lady came in and bought most of it. 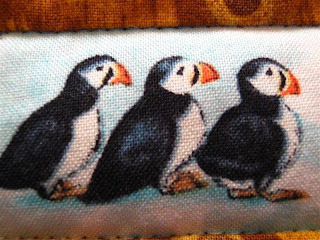 A month later I found out that one of my quilting teachers had bought the fabric, and she gave me a piece of it! My friend brews his own beer, so this is a great block! 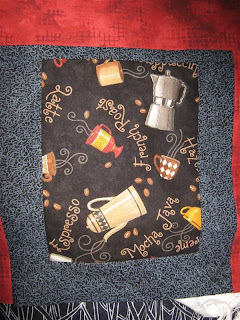 4) Here's the coffee fabric that Ginny so kindly sent to me after I spotted it on her blog! 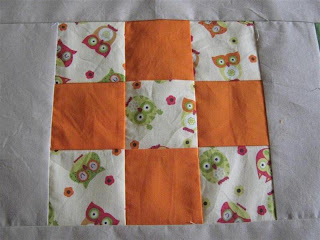 5) I really like this block! I'd been looking for fabrics with vinyl records but no luck. 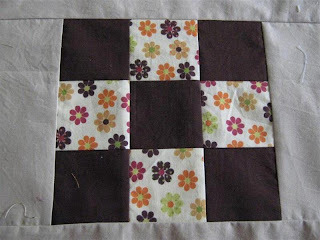 My friend collects them, so I really wanted a block, and I realized that this must be about the easiest applique block ever :) I had just watched someone else get a machine-applique (or is it called rough-edged applique?) lesson from my quilting teacher Leona, so I went at it with an ice cream lid to get a nice black circle outlines, a mason jar lid for the inner grey label circle and my zigzag stitch and circled round and round. Fun! 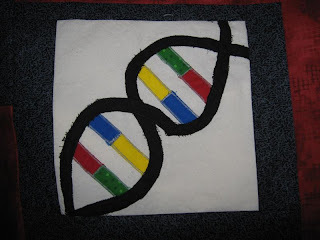 5) And because my friend is a scientist and works with genes, I really needed a DNA block. I looked through all my old biology books for DNA illustrations and threw together a very improvised version. The four different colours are the nucleotides, the black line represents the double helix. Very improvised stitching but it's good enough for my taste! I'm still deciding on the backing for this one, but I have until the fall to finish it, so no worries there. I love how it's turning out so far, and every block is meaningful and reminds me of an interest/hobby of my friend. 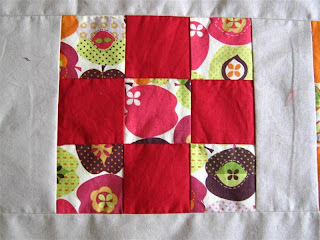 Ah, the darling apple quilt. 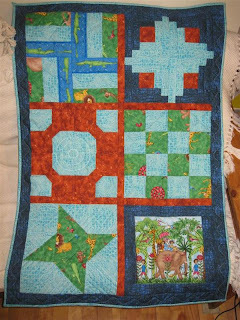 All the pieced borders are on, and the quilt has been folded up on a pile for a week. Problem is that my great zoom-zoom-done baby quilt kit means that I'm now exactly one 4" stripe of sashing fabric short because I cut smaller strips for the baby quilt, and the store doesn't carry the fabric anymore. Typical. Now, all is not lost. I can stretch the sashing I have, it just means straight joints instead of diagonal ones, which I think are nicer, but on a solid fabric maybe won't make that much difference. Before I go that route, though, I will check another store in the area (luckily it was a chain store where I bought the original fabric!). It's a bigger franchise and might still have the colour in stock. I have made great progress on the character quilt, though! I have a feeling that the tope will be completed by the end of today! Photos to follow next week. 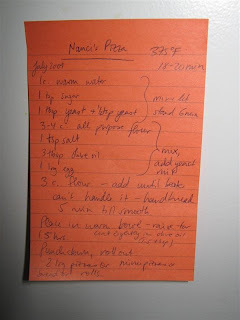 I also have to take one little sidetrack and share another great recipe from Nanci at Quilting At The Cottage with you. She's taken my disinterest in making home-made pizza away! 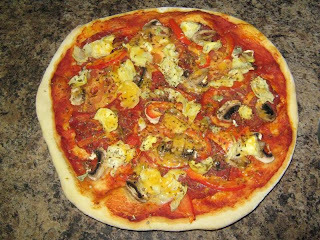 Check out her recipe, it makes beautiful pizzas and the dough is easy. 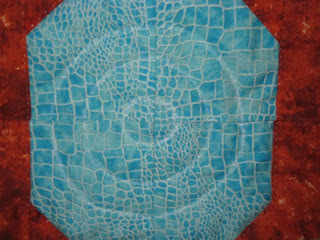 Thanks to all of you who shared tips about quilt backings! 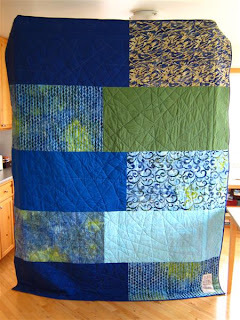 My proudest moment was when I selected and cut out all the fabric needed for this quilt except the backing. I felt like I had a quilt kit in my hand, zoom zoom, done! 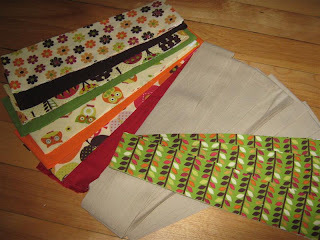 Thanks to my enormous fabric purchases earlier this year, I have all kinds of solid fabrics in my stash and felt like I was in a fabric store, wandering around with the Apple fabrics and matching the solids to the prints. The green leafy fabric will be the binding, and the grey-beige the sashing. Making a big quilt had the advantage that I could strip piece more of the 9 patches! 3 strips per fabric pair gave me 8 9-patch blocks, and since I had 4 fabric pairs, that got me up to 32 blocks. I made 3 extra for a 5x7 block layout. 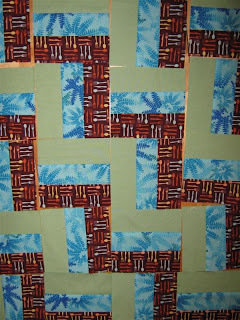 Originally, I had planned 1.5" inner sashing and 2.5" outer sashing, but with only 5x7 blocks, I needed a bit more width, so rather than using more blocks, I made all the sashing 2.5" wide. By cutting along the selvage, I managed to get strips long enough for the width of the quilt. 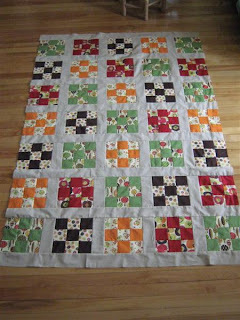 I pieced the outer sashing for the length of the quilts, and am in the process of adding a pieced border out of the left over pieces of apple/owl fabric I had from strip-piecing. This is how far I've gotten in 3 days, gosh, it feels good to make progress like this! 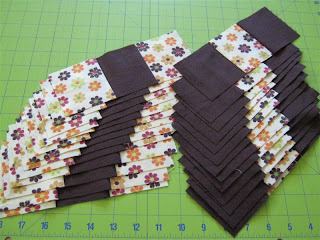 I have the top and bottom pieced strip ready, then there'll be another sashing border, I'll probably use the 2" strips I already cut, because I'm getting low on this particular fabric, and the it's time for binding. Oh, and a backing. Does anyone else have a hard time picking out backing fabric??? I always try to match the backing to the front, though I see many of you don't, and it still looks great. 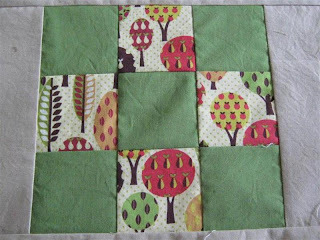 Also, I think of quilt backs purely as a necessity to hold the batting in, I look at the top, not at the back, so I don't want to use pretty fabric that I might want to use on a quilt top some day... very tricky! So, as I said, inspiration struck, not just today but over the last week. 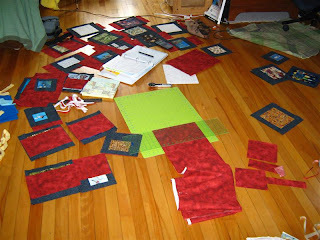 I felt quilts just pouring out of me, so I got started. 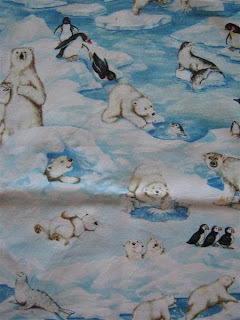 First, I cut into the polar bear fabric I bought in BC. 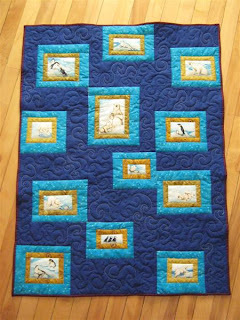 Time for framed theme quilts! 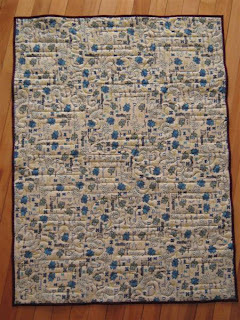 I have a dark blue background planned for this quilt right now, I'll lay it out to see if I like it, choosing fabrics was difficult for this one - it never really popped until I added the beige borders. 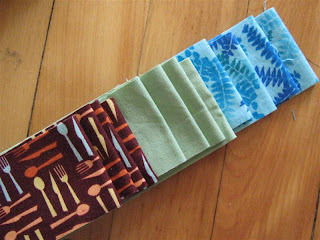 Next, I decided to use the cool cutlery fabric I bought recently. I matched a blue fabric and at first a pale yellow, which also shows up in the cutlery print. However, that combination looked totally blah. 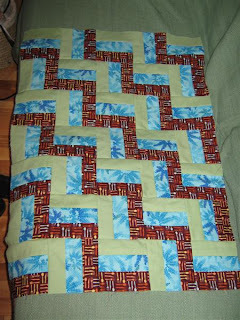 I wasn't entirely happy with the green either, but everything else made the quilt either too bright or too boring. This way at least I have a dark, a bright and a pale/mute print. I decided on a very simple rail fence pattern in a zigzag layout. 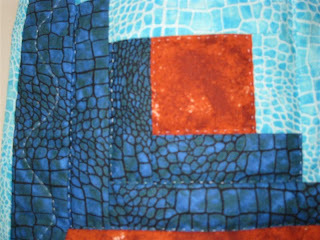 This quilt top came together so quickly, I could barely blink, and I do like the strange colour combination in the end. Let's see what I'll come up with for borders! Some of you might remember the mad hunt for all kinds of very specific fabric for a quilt based on interests of a good friend of mine. I found some weird fabrics and gave up on some others. I thought long and hard how I wanted to frame my blocks. I settled on the black/grey fabric, my friend being a male and all. That decision almost turned out disastrous because I didn't have enough fabric and the store I bought it at is 4 hours away and only open during the week. Yikes! 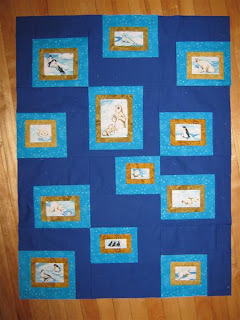 So what started out as mixed width borders (to get wonky placements) from 2-4" was quickly trimmed down to 1/2 - 2" to salvage enough material to frame all blocks. 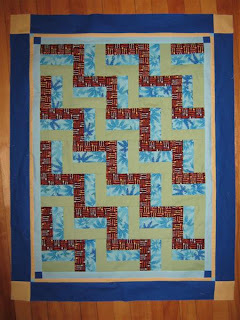 I just managed, the last blocks are framed by pieced borders - oh well, he won't notice! 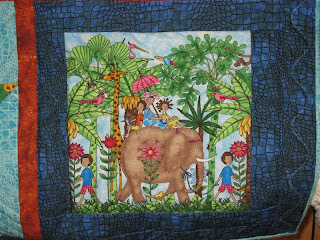 I just read on Nanci's blog that two quilters named Camille and Carrie decided to put on a parade of quilts. 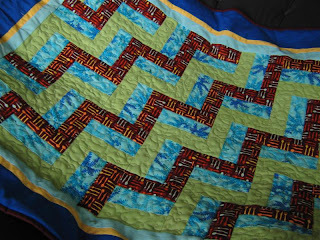 The idea is to show your first and last quilt and describe what you've learned. 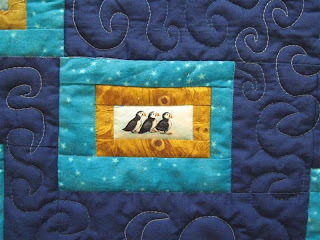 I think these kind of shared quilt stories all compiled on one site are great to meet more quilters! 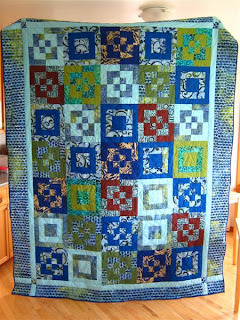 Well, my first quilt is the Late Fall Quilt that I showed for the Blogger's Quilt Festival - it's a double Irish chain pattern that I learned at evening school taught by two lovely volunteers, Helen and Leona. 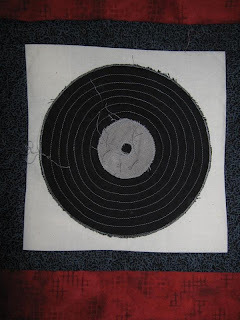 I learned how to machine piece, strip-piece, machine-quilt (free-motion stippling and wavy lines and straight lines with a walking foot). 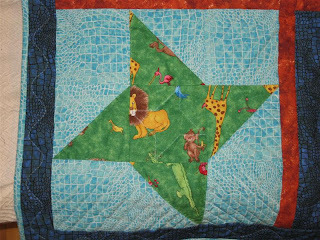 I guess I kind of have two first quilts actually, because I took a second class at the same time to learn hand-quilting, and started and finished the Jungle Baby Quilt for my newly-born nephew at around the same time as the Late Fall Quilt. It was a similar class, taught at a different school by a different teacher (Cathy). We learned a variety of block patterns and hand-quilted them. I quilted these diagonal lines without guidelines - then I discovered fabric pencils, what a difference! I'm really glad I finished this next quilt just a few days ago so I can blog about it because I love it! It was made for friends of mine who were getting married last Saturday. I blogged about it in the post just before this one. It's an adapted Bento Box pattern. 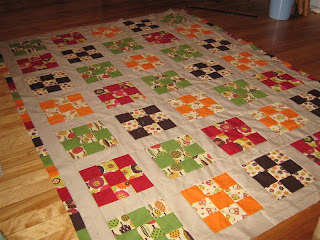 I saw a bento box quilt on Ginny's blog and really liked the pattern. 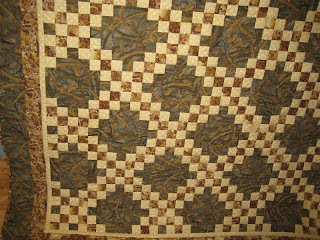 I did my own math and figured out all the block and strip sizes I wanted and even wrote a tutorial about how I made the quilt. 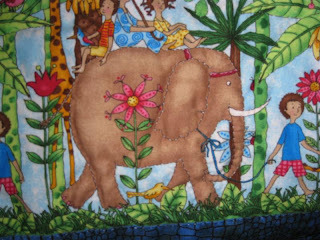 not to feel guilty for buying fabric cause I love fabrics - the joy I get from them is worth every penny! 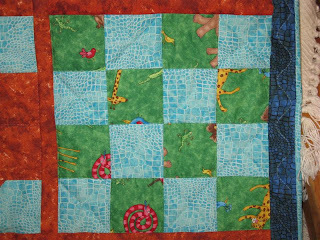 quilters are a lot of fun and very generous! 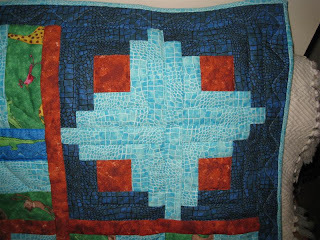 that quilting will be with me for the rest of my life, and since I'm only in my 20s, I'm hoping that will be a long time! 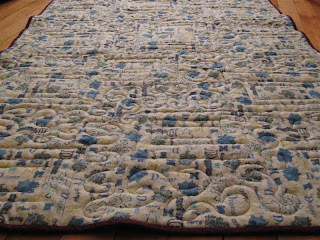 (Oh, and if there are ANY 20-something quilters out there reading this post, I'd love to hear from you - I'm starting to think that I'm weird because I've found only 2 people under 40 here who quilt, and I know NO quilters under 30 here (here being PEI, Canada).